This is the recipe I created for the Betty Crocker Cookie Mix Contest. I don't think it will win, but it was fun to create and my husband's work loved them. I think you could probably cut back to a half a box of Jell-O and these cookies would still be apricot flavored, but a little less sugary. Heat oven to 375 degrees. Line two baking sheets with parchment paper. 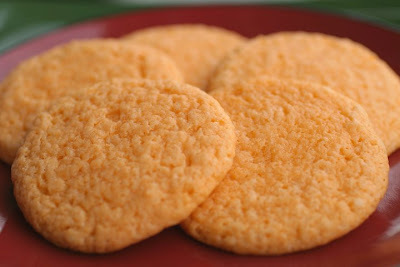 In a large bowl stir the sugar cookie mix and apricot Jell-0 together. Set aside. Next, beat the cream cheese, butter, egg, and almond extract together until fluffy and well mixed. Add the sugar cookie mixture and gently beat until just mixed. Using a cookie scoop, drop the dough onto the parchment about 2 inches apart. Bake for 10 to 12 minutes, until lightly golden around the edges. Let rest on the cookie sheet for 3 minutes before removing to a cooling rack to cool completely. These sound heavenly! Ive never used Jello is a cookie before - what a neat idea! I am loving your blog, by the way :) So many great recipes, and your photographs are gorgeous!